Brittany Kokoszka, a sophomore from Franklin, MA, meets a red-and-white milk cow in the herd at Saturday's open house for CREAM, a class of 25 UNH students who spend an academic year managing the 25-head dairy herd. If there’s one thing visitors to the CREAM open house learned on Saturday, it’s that cows never take a day off – and neither do the hard-working UNH students who take care of them. Not for holidays. Not for snow. And certainly not because they feel like sleeping in. But the students do know how to entertain, even in a dairy barn packed with cows. CREAM (Cooperative Real Education in Agriculture Management) invited students, faculty, staff and the public to the Fairchild Dairy Teaching and Research Center for its open house on Saturday. About 150 people attended, and CREAM raised more than $250 for future events by selling burgers, hot dogs and baked goods. Max Winn, 4, declared he wanted to attend after seeing a poster advertising the day. He likes watching the cows in the field near his home in Dover, but the open house promised a closer view. “He’s been talking about it all week,” said his dad, Carl Winn. So Carl, Max and Max’s twin sister, Kate, drove over from Dover. After being greeted in the parking lot by Jasmine the barn cat, they grabbed passports from the CREAM students at the welcome table and began winding their way through the barns. A facility of the NH Agricultural Experiment Station (NHAES) in the College of Life Sciences and Agriculture (COLSA), the Fairchild Center is known for its research as well as a popular place for teaching the public about dairy farming and agriculture. The CREAM students wrote posters explaining facts about cows: that gestation is nine months, and that babies are kept in a separate room so the mothers can rest before returning to milking. Reading the posters and answering a question from the CREAM student earned kids stickers for their passports, and a full passport earned them a prize. Kate and Max got their questions right, with a little help from dad, but they were skittish of the massive cows, even the resting new mothers. Many of the CREAM students were perfectly positioned to help shy toddlers approach the animals. “Some of us were afraid of the cows, too,” said Hana Krauss, a junior from Woodsville who wants to be a veterinarian. Several other students said they signed up for CREAM knowing it would help make them desirable candidates for veterinary schools if they could say they gained experience milking and caring for an entire herd of cows. Others, like Jake Harris, have more practical reasons. Harris will be graduating this month from the Thompson School’s integrated agriculture program and going back to his family’s farm in Dayton, Maine. The program gave him new perspectives beyond what he learned at home. He learned as much about working with other people as he did about cows, he said. “I got to go really in depth with the dairy industry, into the finances, breeding. It puts me right in to the middle of that. And it was really interesting getting other people’s take, being able to work with a diverse group of people with a lot of different backgrounds,” Harris said. In addition to managing the family dairy herd, Harris will be leading his farm’s education and outreach when the gates open to the public. “It’s shocking, but a lot of kids grow up not knowing their milk comes from a cow. If I can give people new perspectives on what agriculture is, then that is an amazing feeling,” Harris said. 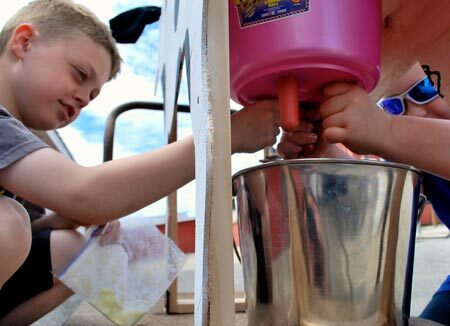 Mickey Cotter, 8, and Ben Abbott, 10, both from Dover, NH, practice milking a model udder at the CREAM open house on Saturday. CREAM students planned the open house to educate their peers and the public about farming and dairy practices. Mickey and Ben thought the practice udder was "cool," but quickly got tired of milking by hand. Alex Abbott ’96, grew up in Newmarket and often visited the dairy cows at UNH with his family, long before he ever thought about attending the university. He now lives in Dover, and brought his 10-year-old son, Ben, to the open house Saturday. Ben and Alex’s girlfriend’s son, Mickey Cotter, 8, also got to learn how to milk by hand at one of the demonstrations. Bending under the warm spring sun, they tugged and squeezed, squeezed and tugged on an artificial cow’s udder as water splashed into a metal pail below the miniature wooden cow. It was "cool" but really exhausting, they said. That’s the lesson Abbott hoped they’d learn. “It was always so fascinating for me, and I wanted them to have more appreciation of the hard work that farmers do, and a taste that milk comes from a cow, not just the dairy freezer at the supermarket,” he said. CREAM is a full-year class for about 25 students, who assume responsibility for a 25-head herd of dairy cows. The students attend lectures and work about four hours each week in the barn. It’s one of only two such programs in the country. Just a few minutes practicing milking in the sun was hard work, but it’s not even close the work CREAM students do all year. Every day -- regardless of rain or snow, sleet or term papers due at noon – students trek to the dairy center to care for the cows. The first shift starts at about 4 a.m., with feeding and milking and mucking out the barn. "I've given the students a lot of responsibility, and I find they really step up to the plate and thrive,” said Drew Conroy, CREAM advisor and professor of Applied Animal Science at the Thompson School of Applied Science. Taking on responsibility was part of the draw for Abby Geick of Bow, a pre-veterinary student majoring in biomedical science. “Everything we do has a direct result in how successful our herd is. If you mess up, you don’t get a bad grade – well, you might, but that’s not the part we care about. We might hurt an animal, or the business, and that’s what we feel more strongly about,” Geick said. The Fairchild Dairy Center, which owns the cows and has hosted the class as part of the NHAES/COLSA research and teaching mission, has benefitted from the students’ labor for 17 years. The Fairchild Dairy develops new methods for dairy herd management through practical research. Some of the cows have special, surgically attached ports into their rumen so that researchers can reach in and take samples, monitoring how well the cows digest different feeds. Other members of the herd are monitored for their milk output and genetic traits. All of the milk the herd produces is sold to Hood and processed in Concord, NH. In addition to several hours a week of lectures and their chores in the barn, the CREAM students form committees to take on special projects. One group monitors feed costs, another maintains the facility and another tracks milk production, while an outreach and education committee planned and advertised the open house. “We were afraid no one would show up, but there were a lot of people and they asked us great questions and were generally really interested,” Geick said, resting in the barn’s kitchen after the event. The day was far from over, though. Leah Caverly, a CREAM-er and second-year Thompson School student from Clinton, Maine, clanked open gates and clucked her tongue at the cows as she coaxed them into the milking room for their second milking of the day. Cows, after all, never take a day off. And neither do the CREAM students.